Need a super thin white filler. Any suggestions? 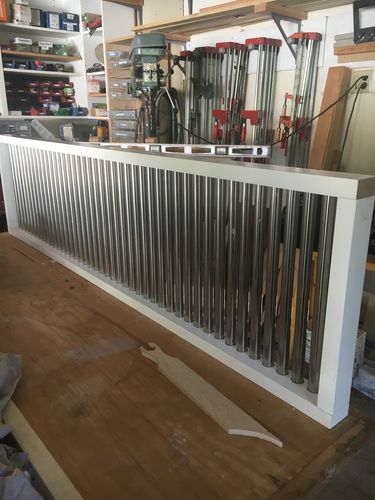 I’m making a drying rack for the kitchen which has 42 stainless steel tubes in a wood frame. I had to make the holes in the wood slightly bigger than the tubes, else there would have been no way to assemble. So now there is a gap around each tube that needs to be filled. There is only 3/8” space between the tubes, so little room for filling, sanding, touch up. So I want a water thin filler that I can inject with a syringe that will level out and fill the gap. The frame is white, so I prefer white. Thin cyanoacrlyate glue would work but its clear, not white. With two holes per tube, that’s 84 joints that need a tiny bit of filling, so you can understand why flowing a liquid into the gap much more desirable than trying to manually apply, level, sand and touch up in such a tiny space. They do make tinted Cyanoacrlyate glue. In white no less. Add white, chalk line chalk, to epoxy and inject it. I think you’d need a thin CA do flow like he wants. The Stewmac stuff looks to be medium. I have no idea if it would work, but I wonder if you could thin white acrylic caulking. I like the idea of something flexible. So the gap doesn’t open and close as the wood shrinks and swells with moisture. May help reduce the water that gets in the gap an eventually degrades the wood. What about a paintable caulking? The acrylic/silicone blends are very easy to tool and have good flexibility. Durham’s water putty. Make it as thin as you like. What size are the holes and how big are the tubes, How big are the gaps? How about just white paint? I know it will shrink, but depending on the gaps, maybe…. Hi. The tubes are 5/8” and the holes are about 1/16” diameter larger. This gives a 1/32” max space all the way around the tube. My first effort was just to use painters calk, which is an ideal material. But there just isn’t enough room to wipe off the excess without a lot of tedious work. I did about 10 tubes that way, and its a real mess. Probably took more than 1/2 hour cleaning up and it’s still not good enough. The calk is too thick and takes a lot of hand work. Ideal material but too labor intensive because only 3/8” between the tubes. I have Durham’s rock hard putty (use it a lot), which if thinned enough would flow in and seal the space. Good idea. It’s not white when it dries, but I could add some titanium dioxide. Or, I could float some Durhams putty into the space, then follow up with a little white paint. Or as suggested, just float some paint into the space, let it dry and add some more. Yes Stewmac sells medium thickness ca glue so that won’t work, even if its white. I just ordered up some titanium dioxide and syringes from Amazon, so I can try out thin ca glue mixed with TiO2 and then injected into the space. I can get ca glue here locally. When the syringes arrive, I can try out all these ideas. Maybe even painters calk can be thinned with hot water and could be injected with a syringe. Tomorrow I’ll post a picture so you can see what I see. Would white vinyl electricians tape work? The item is already assembled. Here’s a couple of pictures. I actually made a smaller one, which makes two drying racks with a about 80 total tubes and 160 holes that need filling. Note the scraping and leveling spatula I made to trying to apply and clean up latex caulk. Better than nothing, but it didn’t really work. Vinyl lectricians tape would be impossible to apply and wouldn’t last very long. Thus the need to inject a liquid filler. What you can’t see, is that the tubes fit very tightly into the holes. So tight, that no glue was needed. I only enlarged the holes a bit at the top to make the assembly possible. The previous drying rack I made used dowels instead of stainless steel. This allowed me to taper each dowel for assembly and use wood glue for assembly. But 1/16” thick stainless doesn’t allow for a useful taper, so I ended up enlarging the holes. To my eye, the stainless looks a lot better than the wooden version, just need to fill the gaps. How about you glue them with epoxy. Then slip a white rubber O-ring or grommet, a nice bronze bushing with 1/32 wall thickness and proper diameters would be a press fit removable for future repairs as well as contrast with the stainless. Or any kind of trim. You could also flare the tubing with a tubing flare tool and make them fit perfect. Also white anchoring cement if you want to stick with that route. You would make your own with white cement type k and plaster of Paris 80 percent cement 20 plaster water to taste. Squazo, I really like your press-fit bushing idea, wish I had thought of it earlier. It would have allowed for a larger hole and quick assembly. And look really professional. Assuming I could find them at a reasonable price. Would need about 160 of them. Also didn’t think of plaster of Paris nor O-rings. All interesting ideas. The 5/8 tube with a 5/8” Forstner bit hole was a perfect fit. Pounding in the tubes with a dead blow hammer made quick work of getting all 42 tubes into one side of the wood frame. 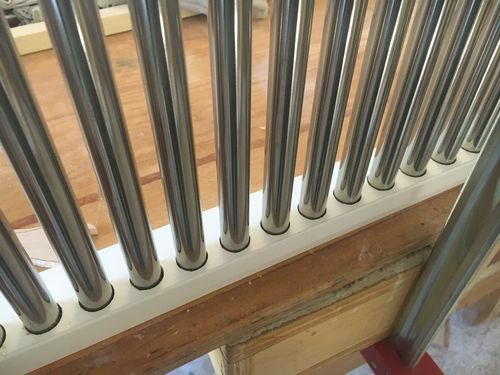 But pounding the other side of the frame, with 42 holes going on top of 42 tubes, each hole being an exact fit…well that wasn’t going to happen. Flaring the pipes really wouldn’t make it any easier. So I slightly enlarged the top of each hole to make assembly possible. Even the wax putties would work. I’d just use an artist spatula, then rub off the excess. I would like to see this rack after it is all finished and installed . . .
the last time I saw something like that was in a US Navy scullery. (way back in the day). John, I’ll definitely post a picture when done. I think the design is pretty neat. Stainless was $35, all off-cuts at the local metal supplier. 5/8” was what was on sale, so that’s what I bought. My neighbor has a horizontal band saw and we cut 6 or 7 pieces of tubing at a time. That went pretty fast, though I did need to make a jig to hold the individual tubes in place while cutting. Its amazing how time consuming ‘simple’ custom projects can be when they aren’t all that simple.